Walking Through Banff's History is an excellent way to experience the roots of Banff's unique community character. 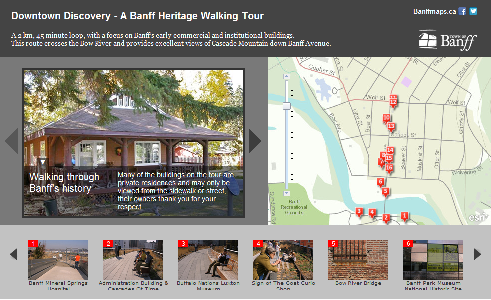 Download Walking Through Banff's History (PDF) or try out the new interactive Walking Tours. Five tours have been optimized for desktop and tablet viewing, they integrate imagery, topographical maps and aerial imagery of our heritage sites. Many of the buildings on the tour are private residences and may be viewed only from the sidewalk or street.